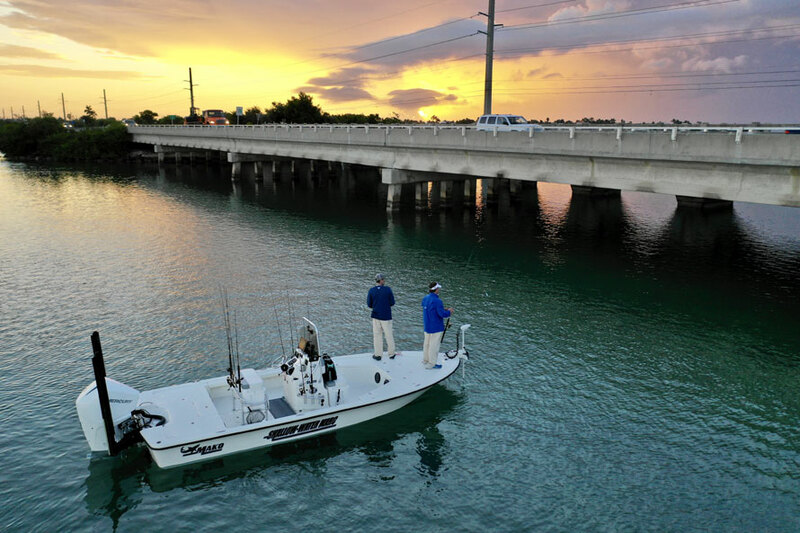 When fishing bays and estuaries, Poveromo gets behind the wheel of his 2018 Mako 21 Light Tackle Skiff (LTS) – SHALLOW-WATER MARC. This bay/flats-style boat from Mako is powered by the new Mercury V6, 225-horsepower, FourStroke outboard. 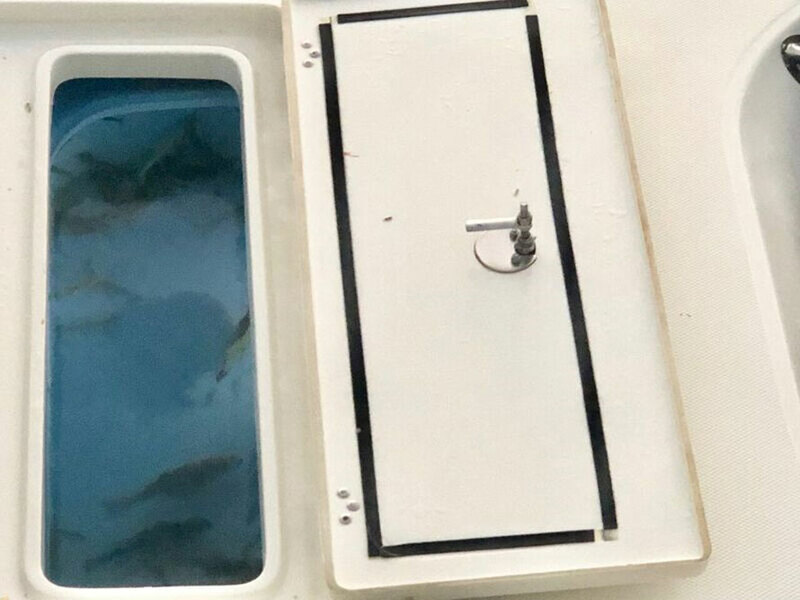 It is fully tricked-out with the latest fish-catching equipment. 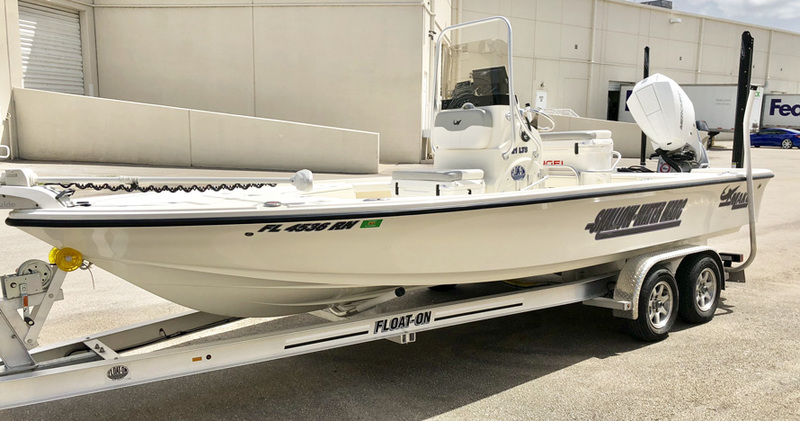 With an overall length of 21-feet, beam of 8-feet, four-inches, and an approximate loaded weight of 3,400 pounds, this new 21 LTS features plenty of fishing space along with a soft and stable ride. 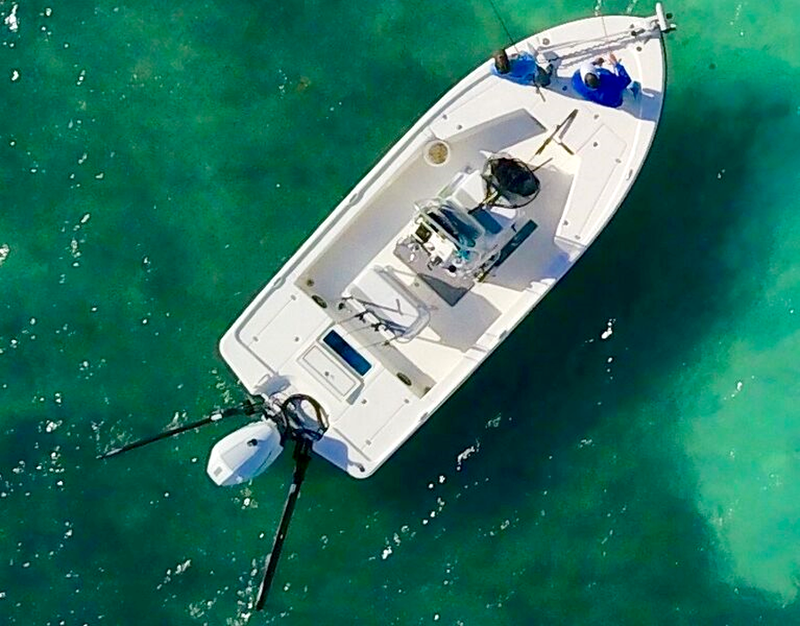 Matched with a 17-pitch Mercury Tempest prop and hydraulic jack plate by Bob’s Machine Shop the SHALLOW-WATER MARC generates a very economical cruising speed and top ends at 48 miles-per-hour, heavy. Factor in the 56-gallon fuel cell, and traveling long distances aboard the boat is an easy, quick and enjoyable proposition! GOING LIGHT, AND FAR – Looking to lighten up this flats-style boat to access even skinnier waters, and dramatically increase its torque and range, Poveromo powered with Mercury’s new V6, FourStroke, 225- horsepower outboard, which, incidentally, at 475-pounds, is the lightest in its class by nearly 60-pounds. 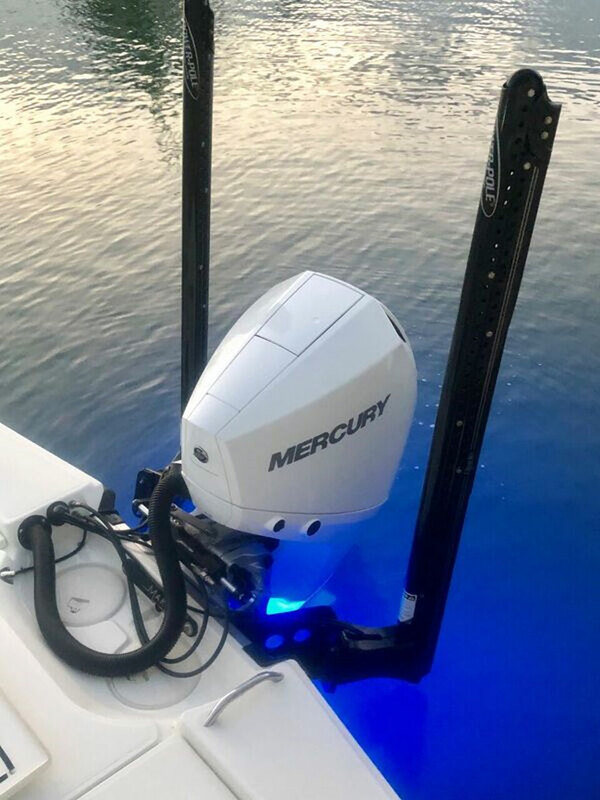 Ordered in Cold Fusion White (one of four factory color options), this new outboard generates its strong torque, in part, through a 3.4L (209 CID) block with Computer Controlled Electronic Fuel Injection (EFI) with Advanced Range Optimization. To maintain plenty of power for electronics, the outboard features an 85-amp alternator with Idle Charge. 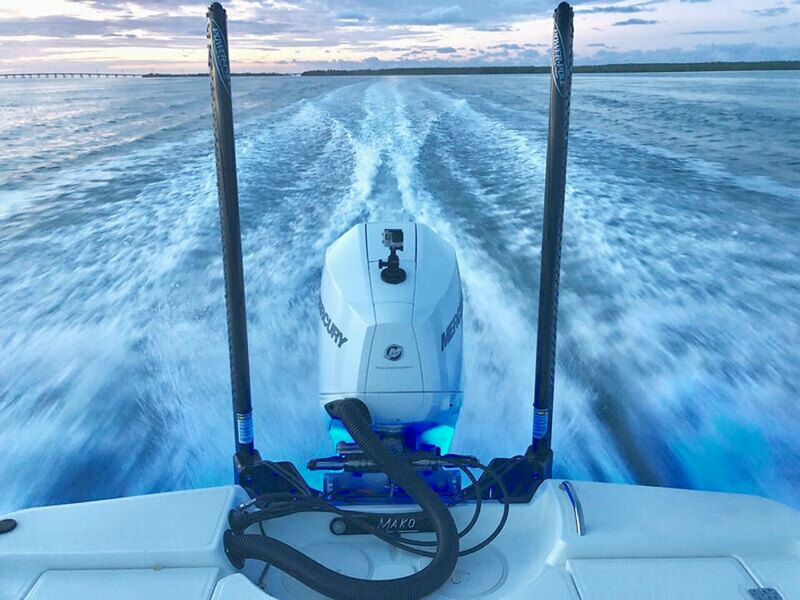 THE CONTROL CENTER – The console features a tall windshield and plenty of dash space to accommodate a SIMRAD NSS 12 Evo3 Fishfinder/Chart Plotter, SIMRAD VHF, and compass. 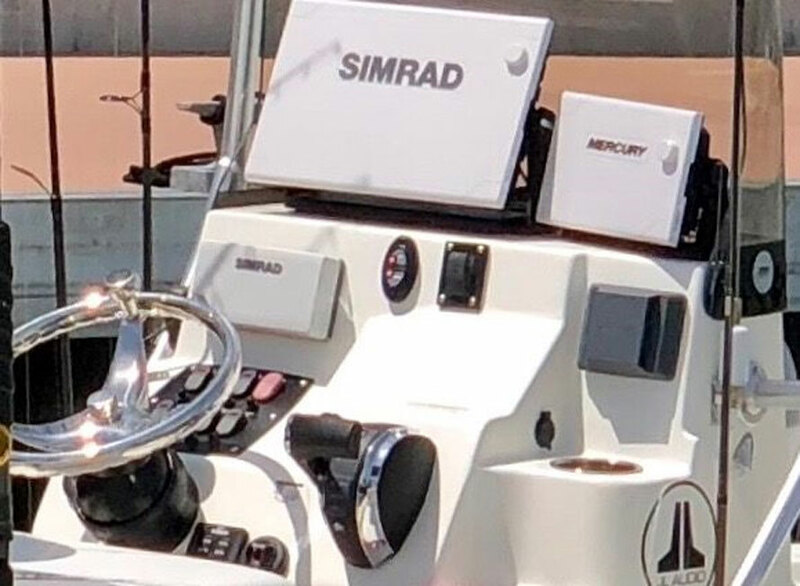 The SIMRAD NSS 12 Evo3 unit, incidentally, features SiriusXM Marine Satellite weather and also 3D StructureScan by Simrad. 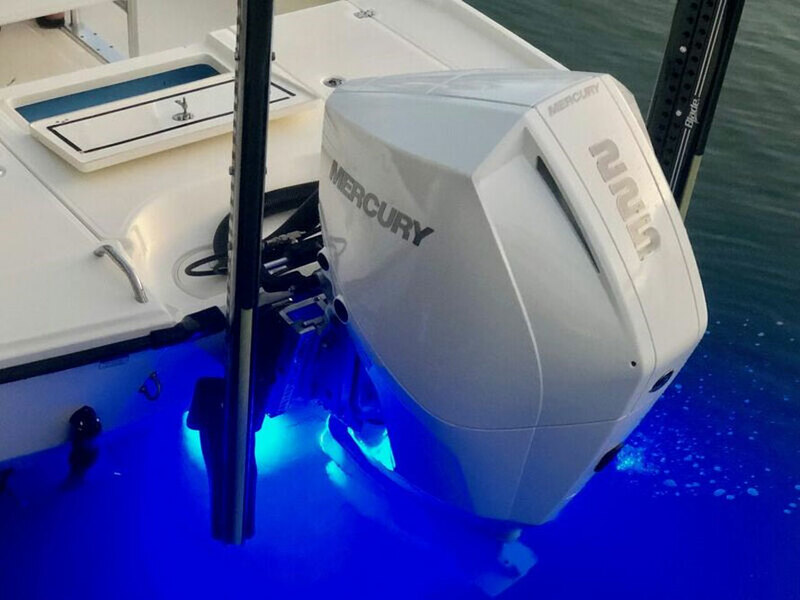 A Mercury Marine VesselView unit displays rpms and all vital engine functions such as temperature, speed, fuel flow, efficiency, trim and much more. 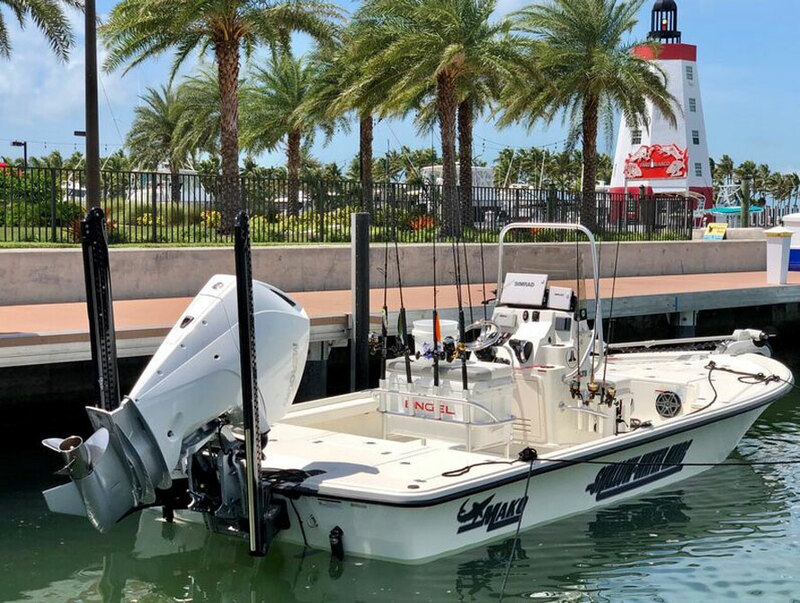 A state-of-the-art JL Audio) sound system with power amp, along with SiriusXM Marine Satellite Radio, lets the SHALLOW-WATER MARC make a bold statement in the entertainment arena. 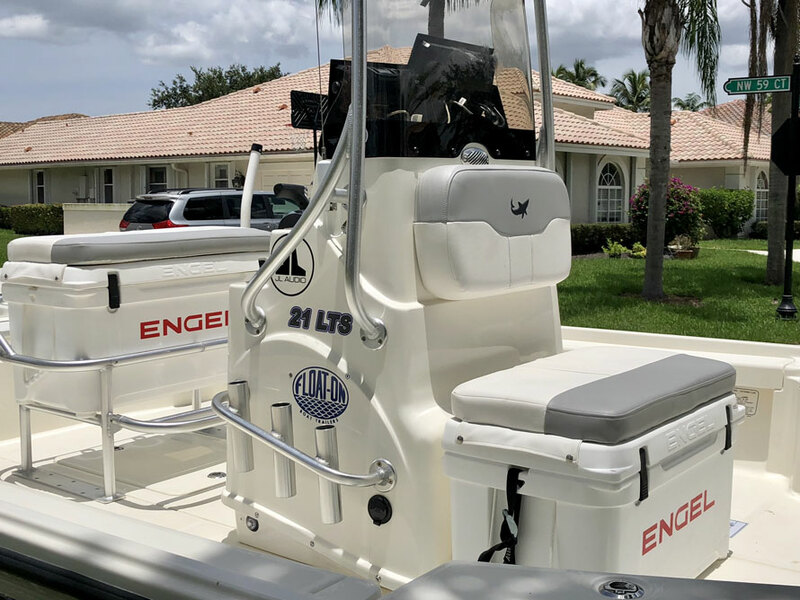 Within the console, incidentally, are two cranking batteries and battery charging systems for both the cranking batteries and the three trolling motor batteries. Also, in here, you’ll find a fire-extinguisher, flares and first aid kit. Speaking of safety, the deluxe tournament console grab rail is perfect to hang on to at speed. There’s an aft 30-gallon, fully-plumbed live well, surrounded by plenty of aft deck casting space. In the bow, there’s a MotorGuide Xi5-80FW wireless trolling motor (24Volt, 80-lb. thrust). A custom SeaDek helm pad further comforts the ride, while adding a sharp touch to the skiff. LOCKING DOWN – For instantly and precisely “locking down” to hold position, Poveromo relies on the new 10-foot, Blade Edition Power-Poles. These units feature quiet pumps and the fastest deployments and strongest holds in the Power-Pole line. A wireless remote enables activation from anywhere aboard the skiff, and there’s also the standard console switch. 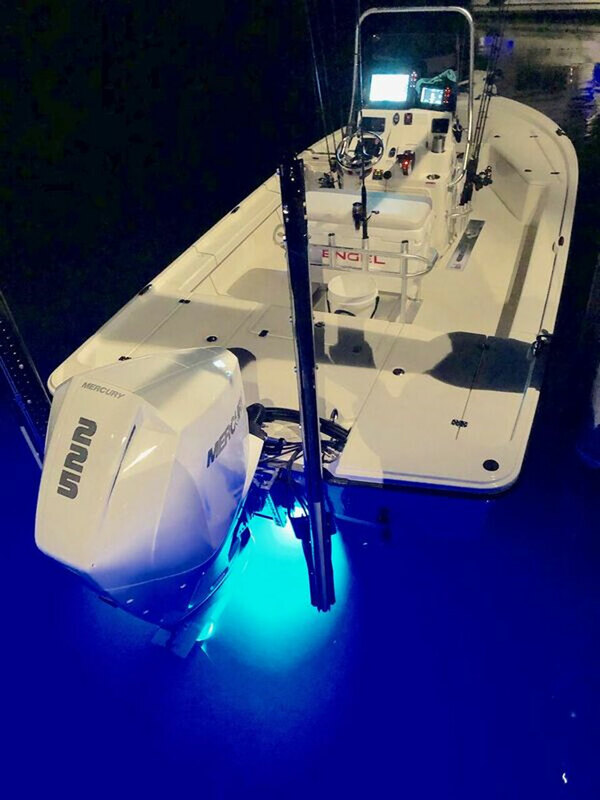 LIT UP – To attract both bait- and game fish for night and low-light excursions, Poveromo added four Shadow-Caster Marine LED lights. The six-inch models (SCM-6) represent the company’s middle-sized underwater LED boat lights. 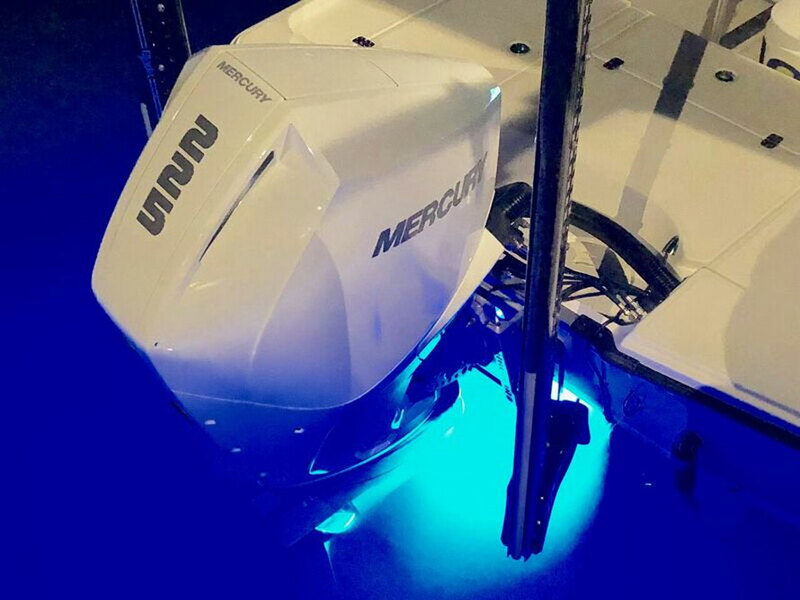 The “Bimini Blue” hued lights are housed in 316 stainless steel and flood the area with 120 degrees of penetration. Two lights were mounted underneath the transom – aimed to shoot downward, whereas the other two were positioned on the transom – to shoot directly outward. The new SHALLOW-WATER MARC is equally at ease drifting in 12-inches of water as it is running through rough bays. 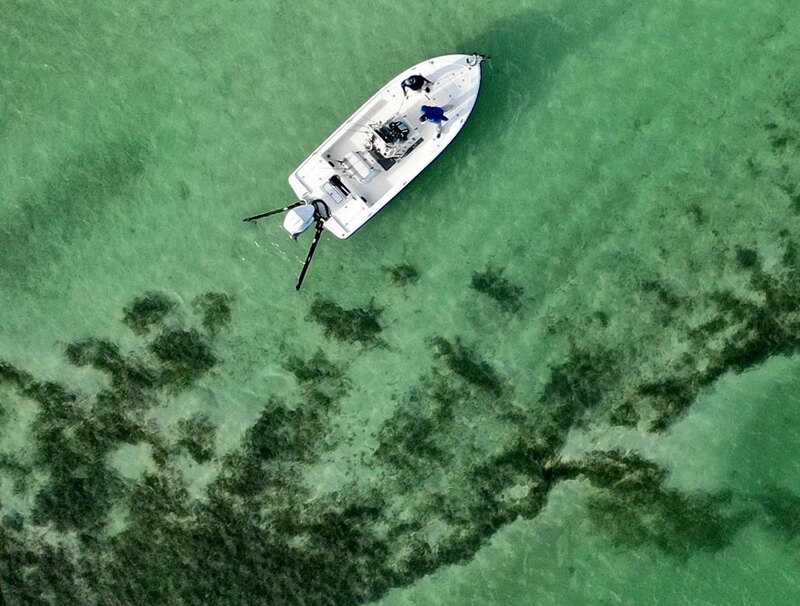 It’s the ideal shallow water boat, blending in skinny water performance with a big boat ride – an important combination when seas kick up and there’s a lot of open water to navigate. KEEPING DRY & COOL – An Engel 50-quart cooler is situated in front of the console, for drink storage. The cushioned cooler serves as a seat. A 65-quart Engel cooler – also cushioned – provides seating and even more storage within the rocket launcher confines. 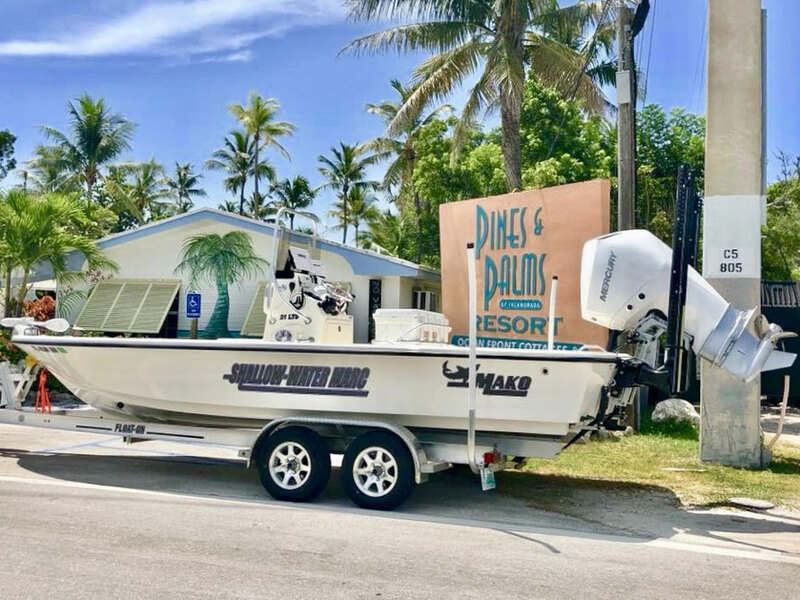 TRAILERING - To get the SHALLOW-WATER MARC to and from boat ramps, Poveromo relies on a custom-built FLOAT-ON trailer. The dual axle trailer is equipped with brakes, radial tires on 13” aluminum Star mag wheels, and a spare tire, hub and spindle assembly. It has a gross vehicle weight rating of 5,100-pounds.